Outdoor Patio Furniture: Replace or Restore? Whenever outdoor patio furniture becomes worn or outdated looking, people usually assume that they have one option, which is to buy new furniture. Many people are not aware that restoring their existing patio furniture is not only possible, but it also offers many benefits. It is a green process, which will save you money while also saving the environment. 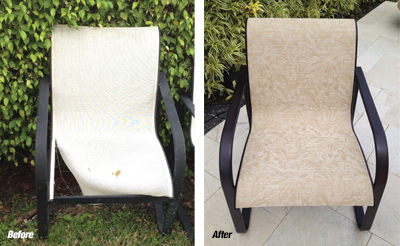 If your existing furniture is in good structural condition, it can be refinished to a like-new condition. One great reason to keep your current patio furniture is because purchasing new furniture of the same quality is much more expensive than simply refinishing it. By refinishing your current chairs, lounges, and tables, you are able to keep your current outdoor patio furniture, save lots of money, and customize your patio furniture with a large selection of fabric and color choices. This allows the customer to customize their restoration to fit with their existing décor to create an overall coordinated look. The flexibility and performance of powder coating makes it a great choice for any metal restoration project. The following is a description of the methods used in the furniture restoration process. Powder coating is an advanced method of applying a decorative and protective finish to a wide range of materials and products that are used by various industries and consumers. The powder used for the process is a mixture of finely ground particles of pigment (color) and resin (protective finish), which is sprayed onto the surface to be coated. The materials to be coated are electronically grounded to attract the charged particles that adhere to the surface. After being heated in a curing oven, the powder fuses into a durable and protective coating. The result is a uniform, high quality, and attractive finish. Powder coating is the fastest growing technology in North America, providing numerous industrial applications in all forms of materials and products. Powder coating is extremely beneficial when applied to outdoor furniture because of its excellent exterior performance. Patio furniture restoration involves re-slinging, re-strapping, and refinishing the furniture’s frames. The restoration process includes completely stripping off the old, dull finish by sandblasting with aluminum oxide. The metal surface is then pre-treated with a five-stage chemical pretreatment process. This properly prepares the patio furniture for the powder coating application. The powder is sprayed onto the metal surface of the furniture that is then baked in an industrial oven to cure the powder to a beautiful, long-lasting, final finish. 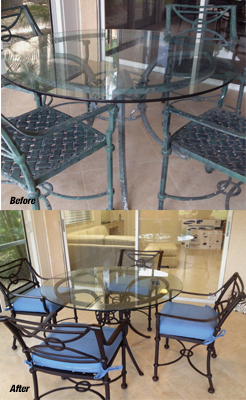 Since all of the furniture that we restore is in South Florida, the most corrosive environment in the world, we add an additional epoxy powder primer coat. This provides an extra layer of corrosion protection and is very rarely found on an original coating. Once the powder coating process is completed, the new straps or sling materials are installed along with any protective foot glides to protect flooring. As you can see from the photos, the complete restoration process—involving sandblasting, chemical pre-treatment of the base metal, and applying a durable, baked-on, powder coat finish—can be quite amazing. Absolute Patio Furniture Restoration is a division of Absolute Powder Coating, which is a leader in the architectural industry. They specialize in patio furniture restoration for hotels, condominiums, country clubs, designers, homeowners, and manufacturers. Their process includes sandblasting to remove existing finish and surface corrosion, chemical pretreatment, and a two-stage powder coating system for ultimate performance. They offer a large selection of colors and textures and are certified refinishers for some of the largest furniture manufacturers in the country. 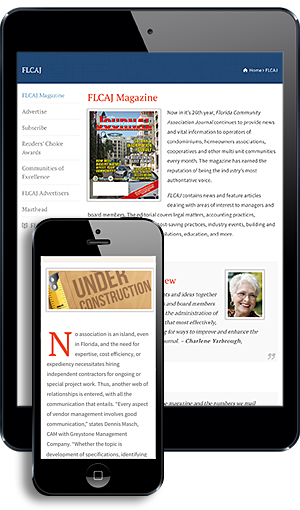 They are certified by the American Architectural Manufacturers Association (AAMA). For more information, call (954) 917-2715 or visit www.absolutepowdercoat.com.